It's that time of year when mosts of the Northern Hemisphere is starting to warm up to the idea of being outside. Going for a run in the fresh air sounds appealing, but don't lace up your shoes just yet. Spending a few more minutes at your computer (or in some cases, your mobile device) can help you choose the best route and make the most of your workout. MapMyRun helps you plan a running or jogging route. Free (but ad-supported; ad-free paid versions available) cloud-based service MapMyRUNoffers a host of tools for runners of all levels. 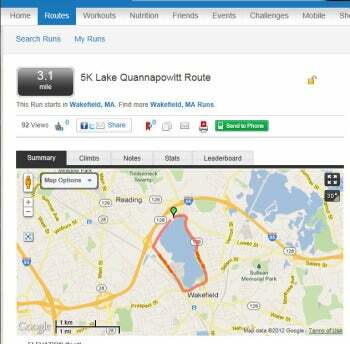 MapMyRUN lets you search for nearby running routes, or you can create your own on its embedded maps. Getting started with MapMyRUN is a breeze: Sign up for a free account, and you'll be good to go. Your options for planning and tracking workouts and nutrition are neatly laid out, in a tabbed interface across the top of the screen. From your Home screen, you can see your recent activity, including workouts you've completed and food you've logged. 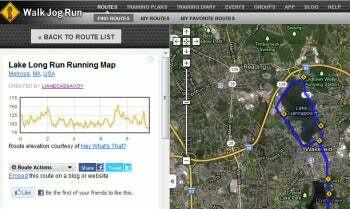 Read the full review and sign up for MapMyRUN (free). WalkJogRun's maps show you what your run might look like in real life. 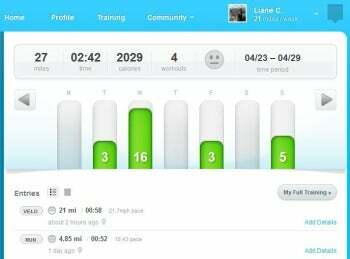 Cloud-based service WalkJogRun can help offers several useful tools for planning and tracking your workouts. WalkJogRun lets you see the distance and elevation of the routes you map online. Like free rival MapMyRUN, WalkJogRun lets you map out routes to calculate your distance and calories burned, and lets you search through routes created by other users. This crowd-sourced feature offers a great way to find new routes. I was pleasantly surprised to see a couple of routes created by a neighbor, which allowed me to discover new routes to vary my regular routines. (You can hide the routes you create from strangers and friends with the service's privacy controls. And doing so can be a good idea: I quickly realized that most of my running routes started at my house, so a quick look at them could reveal quite a bit about my usual whereabouts. If you'd like to share your routes with only folks you trust, you can send them via email or post them to a friends-only Facebook account. Read the full review and sign up for WalkJogRun (free). If you took a little bit of Twitter and added in a big scoop of enthusiasm for running, you'd end up with something a whole lot like dailymile. This workout planning and tracking service is heavy on social networking features. Dailymile's graphing features show you how far you've run. Dailymile is free to use: You can sign up for an account with your email address, or by linking your Facebook or Twitter account. Once you're logged in, you can begin creating and tracking workouts, and exploring dailymile's social features. You can track a variety of activities, including running, cycling, swimming, walking, and more, and can add your distance and time, and can rate how you felt. If you're not sure of the distance, you can use the embedded map to track your route, which is handy. Rival services require you to create the workout first, before logging it. Having the map integrated is a nice touch. So, too, is the fact that dailymile's maps follow the curves and bends of the mapped roads as you create your route. FriendFit also offers this feature, while other services don't offer it by default, instead requiring that you manually adjust your route to follow the road. The only downside is that dailymile shares everything with all its users, leaving you with less privacy. Read the full review and sign up for dailymile (free). Fun and easy-to-use, FriendFit is marred only by its policy of oversharing your workout data. Working out is hard work. And all too often, so too are the fitness services that are designed to help you map and track your workouts. But not FriendFit: This social network-meets-fitness logging and mapping service offers plenty of practical features for fitness buffs of all levels, but manages to make using them a whole lot of fun. 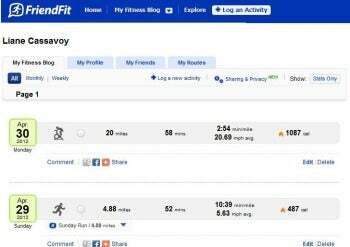 FriendFit makes it easy to see your recent fitness activities at a glance.FriendFit is a free (ad-supported), cloud-based service that connects with your Facebook account. If you don't use Facebook--or if you simply want to keep the two services separate)--you can create a FriendFit account in a matter of minutes. And once you're logged into the service, FriendFit is a breeze to use. You can log fitness activities, plan group activities, and map workout routes from FriendFit's attractive home page. Read the full review and sign up for FriendFit (free).